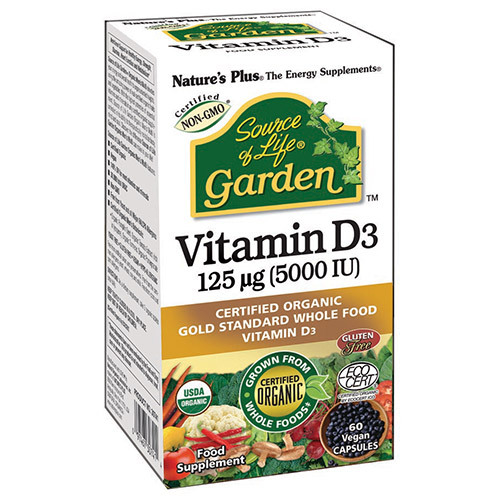 Source of Life Garden Vitamin D3 with Organic Gold Standard Nutrients is the first supplement to provide 5000 IU of 100% plant-source cholecalciferol, from an exciting variety of organic, healthful mushrooms. Feel the remarkable benefits of obtaining essential nutrients from all-natural, organic whole foods! 5000 IU Vitamin D3 - The first plant-source cholecalciferol, from a blend of eight different organic mushrooms. 500mg Certified Organic Mushroom Blend - Supplying 5000 IU vitamin D3 and many other healthful nutrients. Organic Whole Food Base - fruits, vegetables, green foods, mushrooms, algae. Vitamin D3 (as D3, cholecalciferol) (from Certified Organic Mushroom), Certified Organic Mushroom Blend, Oyster Mushroom (Pleurotus ostreatus), P. eryngii, P. nebrodensis, Wood Ear Mushroom (Auricularia auricula), Cordysim™ (Bionectria ochroleuca), Maitake (Grifola frondosa), Shiitake (Lentinula edodes), White Wood Ear Mushroom (Tremella fuciformis). Other ingredients: Certified Organic Whole Food Blend [Bulking Agent (Rice Maltodextrin§), Rice Protein§, Acerola Extract§, Cayenne Pepper§, Broccoli Sprout§, Cauliflower Sprout§, Garlic§, Cordyceps Mushroom Mycelia§ (Cordyceps sinensis), Ginger Root§, Kale Sprout§, Maitaike Mushroom Mycelia§, Lemon Peel§, Parsley§, Pure Beet Juice§, Pure Carrot Juice§, Pure Spirulina§, Turmeric Root§, Shiitake Mushroom Mycelia§, Spinach§, Tomato Juice§, Wild Bilberry§, Wild Blueberry§, Pure Chlorella§], Certified Organic Mushroom Blend, Capsules§ [Pullulan Polysaccharides (from Aurebasidium pullulans), Carrageenan, Purified Water]. As a food supplement for adults, take two vegicaps daily. 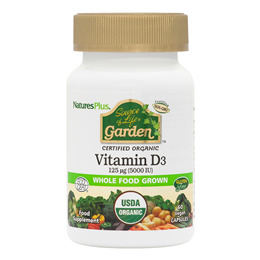 Below are reviews of Source of Life Garden Vitamin D3 - 60 x 5000iu Vegicaps by bodykind customers. If you have tried this product we'd love to hear what you think so please leave a review. I regularly take this product as I find this is the best one for me, and therefore recommend it. I have purchased this product several times, I'm very happy with it, highly recommended.